Gtk.HeaderBar is similar to a horizontal Gtk.Box. It allows children to be placed at the start or the end. In addition, it allows a title and subtitle to be displayed. The title will be centered with respect to the width of the box, even if the children at either side take up different amounts of space. The height of the titlebar will be set to provide sufficient space for the subtitle, even if none is currently set. If a subtitle is not needed, the space reservation can be turned off with Gtk.HeaderBar.set_has_subtitle(). Gtk.HeaderBar can add typical window frame controls, such as minimize, maximize and close buttons, or the window icon. For these reasons, Gtk.HeaderBar is the natural choice for use as the custom titlebar widget of a Gtk.Window (see Gtk.Window.set_titlebar()), as it gives features typical of titlebars while allowing the addition of child widgets. Creates a new Gtk.HeaderBar widget. the custom title widget of the header, or None if none has been set explicitly. Retrieves the custom title widget of the header. See Gtk.HeaderBar.set_custom_title(). Gets the decoration layout set with Gtk.HeaderBar.set_decoration_layout(). Retrieves whether the header bar reserves space for a subtitle, regardless if one is currently set or not. Returns whether this header bar shows the standard window decorations. the subtitle of the header, or None if none has been set explicitly. The returned string is owned by the widget and must not be modified or freed. Retrieves the subtitle of the header. See Gtk.HeaderBar.set_subtitle(). the title of the header, or None if none has been set explicitly. The returned string is owned by the widget and must not be modified or freed. Retrieves the title of the header. See Gtk.HeaderBar.set_title(). Adds child to self , packed with reference to the end of the self . Adds child to self , packed with reference to the start of the self . Sets a custom title for the Gtk.HeaderBar. The title should help a user identify the current view. This supersedes any title set by Gtk.HeaderBar.set_title() or Gtk.HeaderBar.set_subtitle(). To achieve the same style as the builtin title and subtitle, use the “title” and “subtitle” style classes. You should set the custom title to None, for the header title label to be visible again. Sets the decoration layout for this header bar, overriding the Gtk.Settings :gtk-decoration-layout setting. There can be valid reasons for overriding the setting, such as a header bar design that does not allow for buttons to take room on the right, or only offers room for a single close button. Split header bars are another example for overriding the setting. The format of the string is button names, separated by commas. A colon separates the buttons that should appear on the left from those on the right. Recognized button names are minimize, maximize, close, icon (the window icon) and menu (a menu button for the fallback app menu). For example, “menu:minimize,maximize,close” specifies a menu on the left, and minimize, maximize and close buttons on the right. Sets whether the header bar should reserve space for a subtitle, even if none is currently set. Sets whether this header bar shows the standard window decorations, including close, maximize, and minimize. Sets the subtitle of the Gtk.HeaderBar. The title should give a user an additional detail to help him identify the current view. 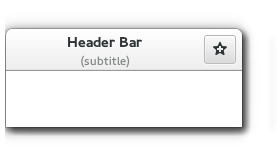 Note that Gtk.HeaderBar by default reserves room for the subtitle, even if none is currently set. If this is not desired, set the Gtk.HeaderBar :has-subtitle property to False. Sets the title of the Gtk.HeaderBar. The title should help a user identify the current view. A good title should not include the application name. The decoration layout for buttons. If this property is not set, the Gtk.Settings :gtk-decoration-layout setting is used. See Gtk.HeaderBar.set_decoration_layout() for information about the format of this string. Set to True if Gtk.HeaderBar :decoration-layout is set. If True, reserve space for a subtitle, even if none is currently set. Whether to show window decorations. Which buttons are actually shown and where is determined by the Gtk.HeaderBar :decoration-layout property, and by the state of the window (e.g. a close button will not be shown if the window can’t be closed).